The Lifetime 1650 In Ground basketball hoop 48" Acrylic Clear Backboard with a foam frame pad features a pro-glass look and provides superior performance. The steel frame gives added rigidity for improved rebound. The graphics of the basketball backboards are screen-printed with UV-protected inks, offering fade-resistant color. Molded frame pad included with back boards. Play like the pros with the high-performance Slam-It Rim of the 1650 Home Hoop In Ground Basketball system. 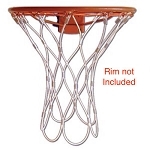 This home basketball rim features an arena-style wraparound brace, supporting a ring of solid steel. Double-compression springs provide excellent spring-back action. The Slam-It Rim is built for aggressive play with welded-steel net hooks and an all-weather nylon net. 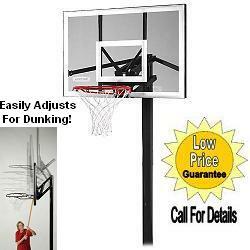 The Lifetime 1650 in ground basketball goal system can easily be adjusted with a broom handle. Players of any age or skill can enjoy the game at their level with these Basketball Standards. The Lifetime 1650 in ground basketball system 4 inch square 3 piece pole is excellent for a strong and solid goal support. 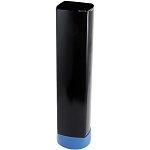 This in ground pole provides added stability and ensures longevity. The Lifetime 1650 In-Ground Basketball Hoop Pole is protected with a powder-coated, weather-resistant coating. Powder coated basketball poles hold up longer to weather. Cement required for installation of basketball hoop with pole. The 1650 In Ground basketball systems are one of our more popular basketball hoops. The 1650 Lifetime In Ground Basketball Goals are one of the best value goals on the market. You can turn this hoop into a basketball goal removable in ground system with an 0040 ground sleeve. nathan46214 Love the b-ball hoop, fast shipping, 100% happy! jeff_faul Fast deliver for such a large package! Thank you! We love it! gas0138ek Great product, as listed, thanks. d.manzella Great item, quick shipping, easy transaction, highly recommended seller, Thanks! macrisa4 Thanks the kids will love it. marcn1965 A++++ for very fast delivery, great product at a great price. seamstressedmom Recommend. Would buy from again in future. Thanks!!! 4attitudes Thank you for the basketball hoop. It was exactly what we wanted!! philsbills Thanks - just as described and quick shipping! jacsracks Great deal, nice easy transaction - BEST OFFERs - quick shipping, Thank you! teropin Excellent Transaction, Great Product, Thanks. emjay12 Super fast shipping on an excellent product. A+++++++++++++ THANKS!!! sploojed Very nice product, fast delivery. jdrtarasen Fast shipping, Great Product, Thank-you !!! orangeman91 Highly Recommended!!! A great basketball hoop & shipment arrived as promised. erictudorcrg Everything was shipped quickly and the product is everything we expected.Great! bsgra Excellent quality and flawless shipment! dannv Excellent transaction, very prompt shipping. Recommended. ecommerce Terrific transaction!!! Item was just as described & received it QUICKLY!! porch_99 Great seller...fast shipping...thanks for a great goal! redsporttrac Awesome product, Amazing deal and Fast Shipping! Highly recommended seller. 2me_racing Item as described, great product at a great price!! Awesome customer service!! rclem27 A+ Seller. Very quick delivery. Very satisfied. tripletreatminis Great company. My family was pleased. billyandanna A+++Seller...Fast shipping Great Product and a Terrific price!!!!!!!!! wesleylogan the b-ball hoop was delivered fast, and is a nice system - thanks!!! walrusman03 good shipping, high quality product, thanks! Terrific transaction!!! Item was just as described & received it QUICKLY! Dimensions: 49" x 34" x 6"